I'm continuing to read through the Atomic Highway rules, the feel of the game is sort of Road Warrior meets Fallout! I've made up a character, but theres more to the rules than just characters, you can work up vehicles too, nothing heavily detailed or overly clunky mind you. I'm not into having to calculate anything complicated. And to be honest I don't recall ever really working up a vehicle of my own for any other Campaign. So this is something I've never done before! 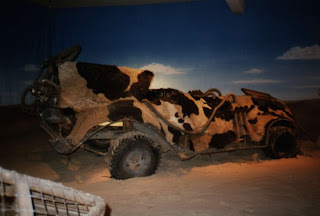 I present to you the Cow Car!! The Cow Car is about one thing, Speed! 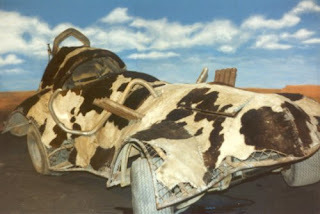 It is basically a powerful engine with a lightweight frame with cow hide tacked on for sheer tackiness factor. The car only has enough room for a driver and no passengers. 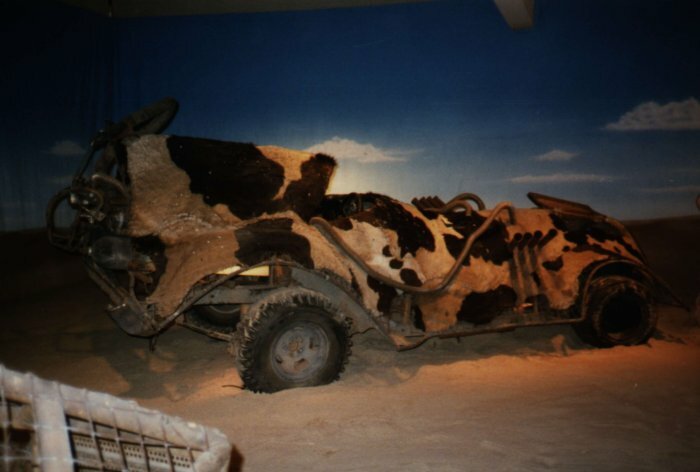 A smoke dispenser has been installed in the rear to obstruct the view of potential ranged weapon attacks and pursuers in order to give the driver of the cow car those precious seconds to speed away. And the driver had best high tail it at the first sign of trouble because this vehicle will be seriously crunched in a fight. No weapons have been installed on this vehicle in order to achieve maximum speed, there isn't much solid to attach serious firearms too anyways. Loosely based on a car that was supposed to be used in Mad Max Beyond Thunderdome, but the scene was cut from the final movie. Clothing: Pants (black), boots, shirt (black), scarf, heavy work gloves. Gear: Binoculars, badge, flashlight. He has some sort of communications headset, and at times is seen talking into it. Who he is talking with is unknown, some claim it doesn't work and he is simply insane, others say it is his home outpost and he is gathering intel for a big raid. 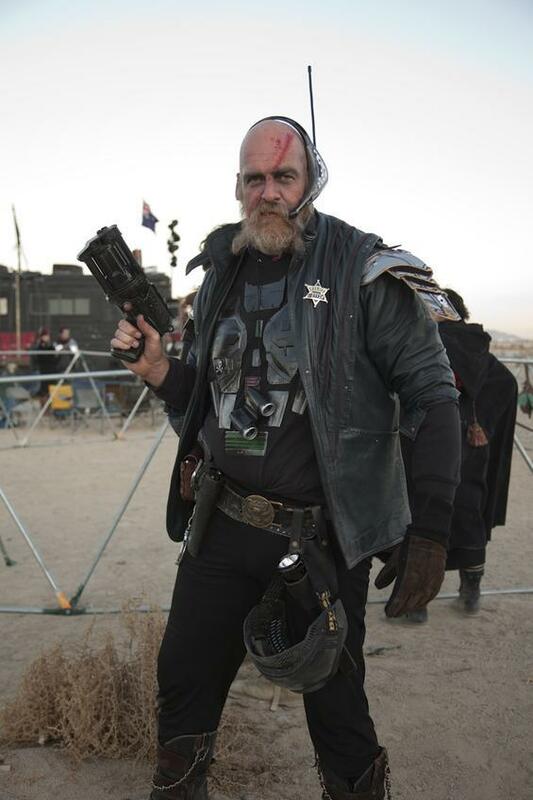 Still others claim he is talking to a network of Law Dogs working together to bring law and order back to the Wasteland. No one knows for certain and Righteous Rude isn't telling. Very little is known about the Lawman known as Righteous Rude. It is believed he grew up far beyond the known bartertowns. Some claim he grew up in a military outpost of some sort. What happened to his people is unknown, what is known is that it apparently wasn't pleasant and Rude has been in a bad mood about it for many years! He showed up one day wearing a badge and has gone about for many years enforcing the law, or at least his version of it. He does have a code of honor, but you don't want to get on his bad side. A while ago I heard about a new Post Apocalyptic RPG; Atomic Highway. My buddy Derek Holland has even done some work on the supplement for it. So being a fan of P.A. RPG's I of course had to get a copy as soon as my gaming budget would allow. My mailman dropped it off today, the system seems to be pretty slick mechanic wise and designed for fast play, I can't wait to check it out. Special Abilities: Hop for 30' forward and 15' straight up, a Hop attack gives them +1 to hit and does double damage. 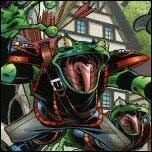 Some Frog Soldiers have tried to use their tongues to grapple their foes or disarm them, this almost always leads to a negative outcome for the Frog Soldier. Frog Soldiers are humanoid roughly man-sized frog men. They are usually equipped with leather armor and weapons of average quality (depending on their master and their mission). Frog Soldiers are often used as cannon fodder in the armies of evil overlords. Their low intelligence precludes them from engaging in missions requiring any sort of critical thinking and they often even bungle the simplest of missions. They tend to rely on sheer numbers to get the job done. However, this tactic can be disruptive as the Frog Soldiers often get in each other's way or interfere with the actions of other allied forces. Tactics is not their strong point. Dragons consider Frog Soldiers to be quite tasty, and many a Frog Soldier unit has been routed at just the thought of a nearby Dragon on the loose! 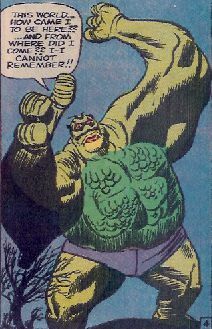 In the Tellos comic series the Frog Soldiers were often more for comic relief than a real threat to the heroes. 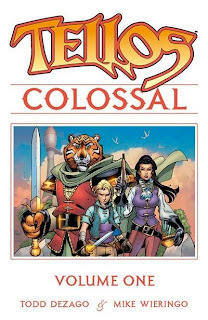 I recently did a post about the cool comic series Tellos. 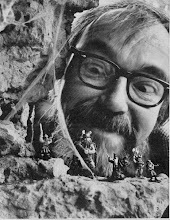 I think the series offers great ideas for a Labyrinth Lord game, especially if your running a campaign with some young folks in it, but it will work for old grognards as well. Last night I think a bit of Tellos visited my neck of the woods in the real world. It stormed so bad I thought an ogre was beating on the roof of the house with a club. In Tellos there is a land referred to as Torrent, a perpetual wandering land of storms. 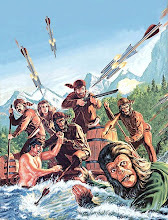 The heroes in the comic had to journey through the land of Torrent it was a soggy experience to say the least. Apparently Torrent came through my neighborhood last night. Land of a thousand storms! It is an Enigma, this place…A wandering expanse of geography, a realm of constant deluge that mysteriously travels about the face of the world, without rhyme or reason…! 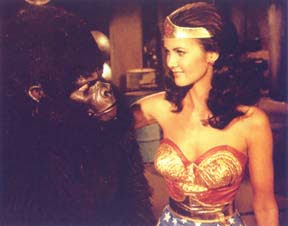 Wonder Woman Endorses Simian Saturday! Special thanks to John over on The Land of Nod for posting about this and to my old Gamma World buddy Tormentor for reminding me about it. If your a fan of Gamma World critters and beasties be sure to check out The Mutation Nation art challenge. There are some awesome mutie beasts featured over there. I can't decide which one I like the most, good stuff!! I came across this magazine cover awhile ago and just thought it was too cool not to share! The Mutant Future/Gamma World side of me instantly came up with all kinds of cool Campaign titles and concepts. Take the P.A. 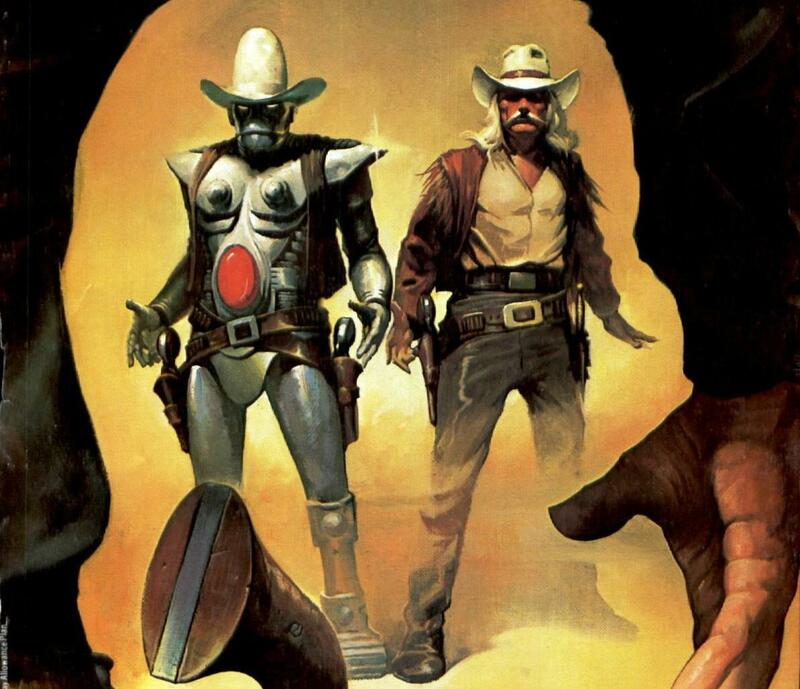 Movies of the 80's toss in a heavy dose of the classic Spaghetti Westerns, stir and voila! Maybe the Goblinoid Games folks will work up a Retro-version of Boot Hill that I can toss into my Mutant Future Campaigns? Course I could just use my AD&D DMG with the Boot Hill conversions I suppose? 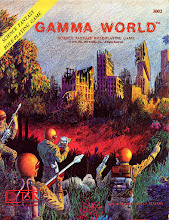 I just think it is too cool that the original AD&D had conversion rules for Gamma World and Boot Hill! I made a run to the local Goodwill/Thrift stores in my area yesterday, it's been a bit since I've had the time to do so. Scored a few books at a great price. Attacks: 3 (clubbing fist/clubbing fist/bite) + see below! 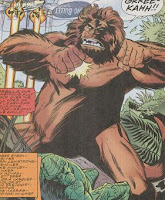 Special Attacks: Rending (if Gorgilla strikes his opponent with both hands he does an additional 1d12 points of rending damage). 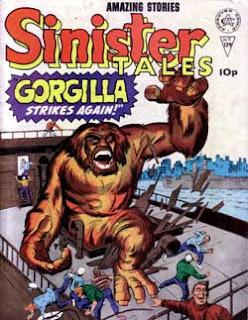 If Gorgilla charges and strikes, he has grappled with the opponent, and there is a 50% chance it has been overborne. Such overbearing inflicts 2-16 points of damage and enables Gorgilla to automatically inflict biting damage as well. Against small foes (7' or less) he can attempt a stamping attack, each huge foot inflicting 5d4 crushing damage. Gorgilla is able to uproot trees of up to70' height, 6' or less diameter and use them as a club or even a battering ram to knock down barriers. Hoard Class: None (course you could always put some cool stuff in his lair, but treasure tends to not interest him). Special Abilities: Keen senses (surprised only on a 1), Rending attack (see above), Stamping attack (see above), Overborne attack (see above). A compilation of the Tellos comic series. If your not familiar with this one you may want to keep your eyes peeled for it. 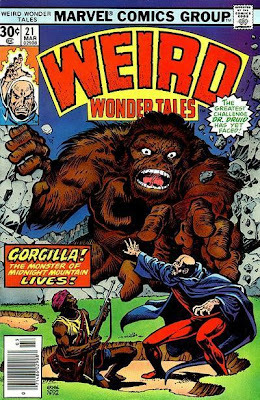 This is not a Savage Sword and Sorcery resource by any means and it is a bit "cartoony" but that's part of the appeal of it at least to me. I've been reading about some of my fellow bloggers running adventures for their kids. Tellos is prime campaign material to use for games with your youngsters. 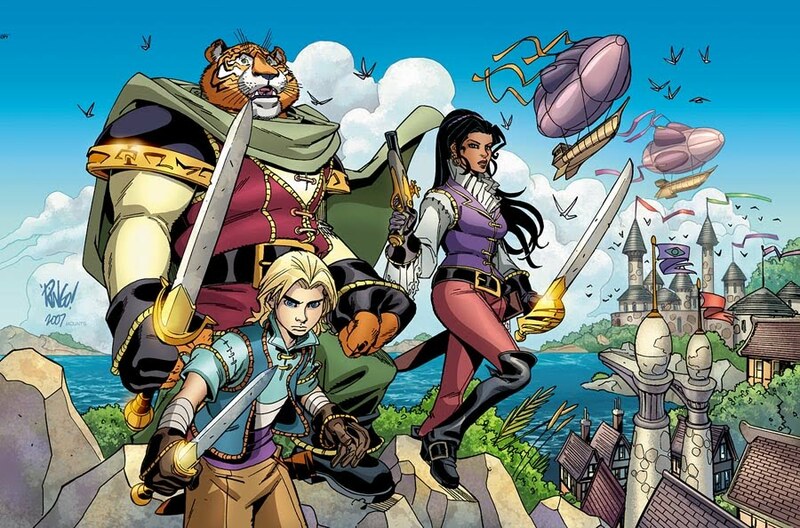 Airships, Floating cities, Frog Soldiers, Fox thieves, Turtle Wizards, cool stuff. I had a few of the original comics for it back in the day and even converted some items from it for my 3.0 Campaign. The comic does have some serious themes, and some of the characters do get injured and even die. If I get time (yeah right) I may stat up some of the critters found in it for Labyrinth Lord. 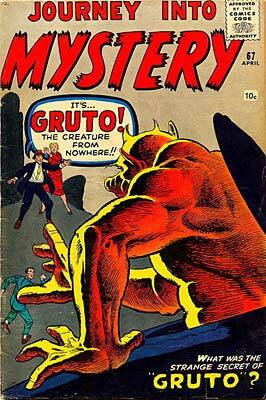 Gruto the Creature from Nowhere! 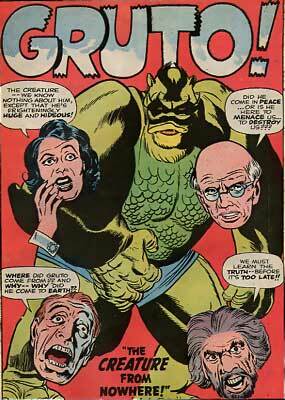 I seem to be on an old school giant Marvel Monster kick lately. Dave B. was kind enough to send me a link to some more beasties from that bygone era and requested that I work up some more. 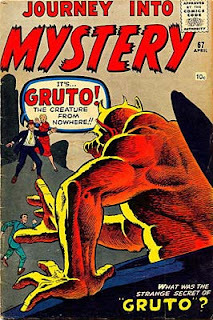 So I chose Gruto for my next write-up. Hoard C lass: (usually only carries his Paralysis Rod and Hologram Emitter on his person, in his ship all kinds of cool tech can be found, nothing of a harmful offensive nature however, XVIII is a good starting point replace magic items with tech equivalents). Special Abilities: He has several hi-tech devices that he can rely upon. Paralysis Rod – the rod functions as a wand of paralyzation. Hologram Emitter Crystal – When activated this duplicates the effects of the Mirror Image spell, creating 1d4 duplicates of the user that will last until attacked or 6 turns have passed. It will take 6 more turns for the device to recharge in order to be used again. The Crystal possesses charges like a wand. Gruto appears as a 12' tall massively muscled green scaled humanoid. His people are peaceful and good. Long ago they discovered advances in technology (or magic if that's how you roll) that enabled them to better themselves and their society. Gruto was chosen by his people to journey to other worlds and share this knowledge for the betterment of all. Unfortunately his vessel was damaged during transport and he has crashed in the wilderness. During the crash he suffered an injury which has caused him amnesia. Still a good and lawful being he doesn't remember who he is or why he is on this strange world. Locals have seen him and assuming he was a horrible monster reacted in fear. Gruto has fled deeper into the wilds, lost and confused. I Defied GOMDULLA The Living Pharaoh! 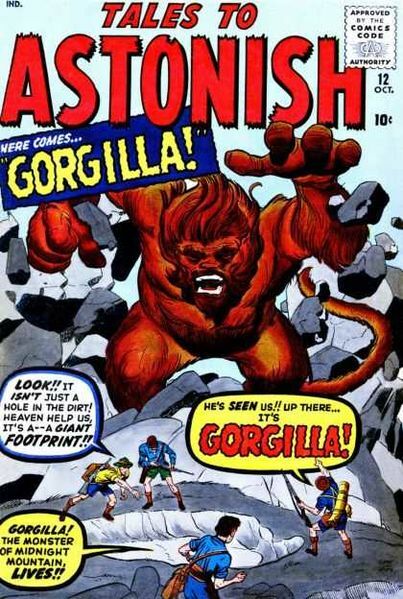 In doing research for my recent Gorlion post and another upcoming beastie I found a pretty wild (some would say silly) monster. I first came across this beastie many years ago in the pages of Dragon Magazine (oh how I miss the old Dragon mag. coming to my mailbox on a monthly basis *sigh*); anyways the monster was statted up for the Marvel Super Heroes RPG (now called FASERIP I believe). Back then there was no internet and I had a habit of using (scavenging) everything I could find for my games so I converted it to my AD&D campaign. My players loved it, well until it trounced half the party (very close to a TPK, they assumed it was "just" a giant mummy). I've long since lost those gaming notes, but Labyrinth Lord is so easy to use I decided to convert this monster to that system. Special Attacks: Telekinesis (using a special form of telekinesis he can mentally hurl rocks up to a range of 120' for 3d6 damage, he can also use this ability against living creatures but they are entitled to a save). Hoard Class : XVIII +5,000 gp, also if your campaign allows for ancient tech items, this is a great place to put them!! Special Abilities: unaffected by Sleep, Charm, or Hold spells. May only be harmed by magical weapons, spells, and fire based attacks (energy weapons dull full damage!). Levitation 3x per day as the spell. Optional : Gomdulla does have a weakness, in addition to being rather slow moving, on one of his feet, hidden deep beneath the layers of bandages is a small stud, which if pressed will render him immobile and put him in a stasis-like state. There is much speculation as to what exactly Gomdulla is. 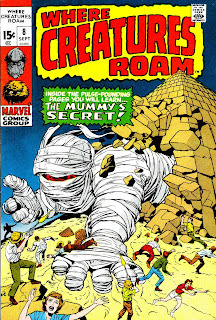 It appears to be a 20' tall giant humanoid wrapped in ancient wrappings like a mummy. Legends say Gomdulla came from another world and found the air of this world burned his skin, so he wrapped himself in special wrappings to protect himself. 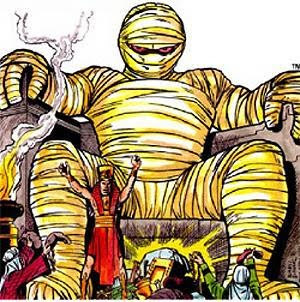 While he has some of the immunities of traditional mummies, he does not have their mummy rot attack ability. Nor has he ever been successfully turned by a cleric. Some sages have speculated that Gomdulla is not a living or unliving being at all but is in fact a construct (Robot) from another world sent here to conquer. Others have called him a mutant noting his abilities of telekinesis and levitation ,as well as, his size and the fact that he has only three fingers and a thumb on his right hand yet has four fingers and a thumb on his left hand. Have fun with this one! If I get to run a Planet Algol Campaign I may just have to use this guy. Maybe the party is in dire need of some Radiation Crystals or other hi-tech treasures, sounds like they need to seek out The Ziggurat of Gomdulla! Also I haven't done the stats, but Gomdulla would fit in just fine in an Encounter Critical game. 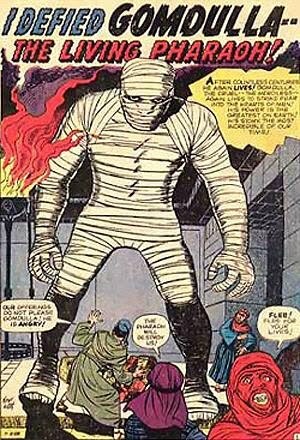 Course you could just make him a giant mummy for your regular fantasy games, but I like to insert the unexpected and unusual in my games. 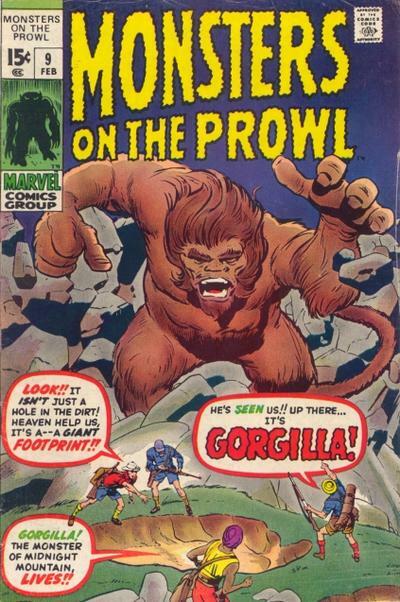 Gomdulla is copyright Marvel Comics and first appeared in Journey into Mystery I#61/1 (October, 1960). 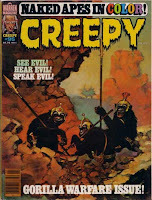 Well its Simian Saturday once again, Thanks for all the great comments on the War Chimps I did last Saturday. 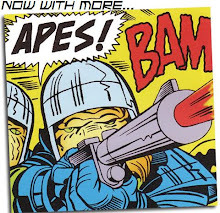 I figure you can never have enough Ape-based beasties to choose from for your gaming fun, so being a big Jack Kirby fan, I worked this one up for your party slaying pleasure! The Gorlion; one time foe (ever so briefly) of Dr. Druid. Hoard Class : Usually have no personal treasure but are often guarding the treasure and lairs of other more powerful beings (especially sorcerers). If guarding another creature's treasure use appropriate Hoard Class for that creature. Special Abilities: Keen senses (surprised only on a 1), Leaping attack (if there is enough room can leap for 30'), Rending attack (see above). 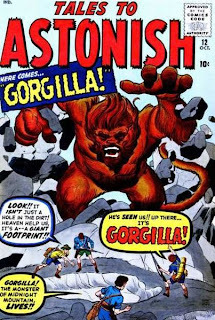 The Gorlion is part ape, part lion. Whether these are sorcerous hybrids (like Owlbears, etc. 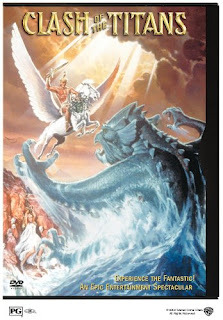 ), otherworldly beasts or mutant monsters is unknown. What is known is that they are fearsome foes and exhibit an uncanny cunning not normally found in such savage beasts. I can see several uses for these beasts, first off they'd make for a cool guardian beast in a sorcerer's lair, sure it's a repeated theme, but it works, plus the party might not be totally surprised by an Ape guardian, but one that is a mixture of ape and lion now there's a surprise. Add in their fast movement and leap attack that will quickly nullify the party's ranged attacks and you've got a group of adventurers in potential trouble quickly, especially if the Gorlion makes some good to hit and damage rolls (claw,claw,bite …REND!). They could be used in this way in "regular" fantasy RPG's (Labyrinth Lord), or other OSR games, Planet Algol etc. You could also do the Gorlions as mutant beasts in your Mutant Future Campaigns, maybe a whole pack of them to make things interesting. No this isn't a regular feature, but I had to chime in on some of the cool free stuff I've learned about this week. I know several other blogs have posted about Talislanta being made freely available but I wanted to mention it as well. Just in case anyone was unaware over on the Talislanta web-site a bunch of the books for the game are freely available in PDF format, with more being scanned as I type. This is just awesome! If you are unfamiliar with Talislanta, do yourself a favor and check it out. I've had many of the books for years and love the fresh look and ideas behind this very original setting. They've posted many books that I have never seen before. I must confess I have never run a straight Talislanta Campaign, but I have looted heavily from it for my games for years! The cool races, beasties, regions, just awesome stuff. My wife loves it too and almost every character she has played in our games over the last several years has been a Talislanta race I converted to whatever system we were currently using (3.X, Castles & Crusades etc...). In other Freebie news, if your looking for some cool and FREE minis for your Mutant Future or other games check out One Monk Miniatures he has just decided to make all of his paper pdf minis free to the public. He's got some great paper minis. Iparticularly like his Mutant Animals collection; the mutant anthropomorphic horse is kewel! While I love my metal minis, I do alot of my gaming at my FLGS, and lugging a ton of metal minis is not only a pain, I've had several have their painstakingly done paint jobs get chipped in all the handling/hauling. Not to mention you sometimes have to really watch some of the little folks who slip over from their Pokemon games to "play" with your minis when your not looking. With paper minis, if the mini gets messed up just print out another one! In other news, Eli and I awhile back did some work for our own setting for the X-plorers RPG, we worked up a bunch of races and had planned on really developing alot of stuff for it, maybe even releasing something for the public. Well real life reared its ugly head, and the project went into a sorta coma, so rather than have the stuff we worked up go to waste, Eli has started posted some of our notes and stuff over on his blog; I See Lead People. 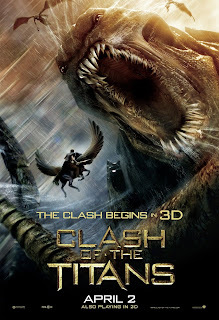 My wife and I got to go see the new Clash of the Titans movie this weekend. Being fans of the original we were both curious as to how the remake would do. 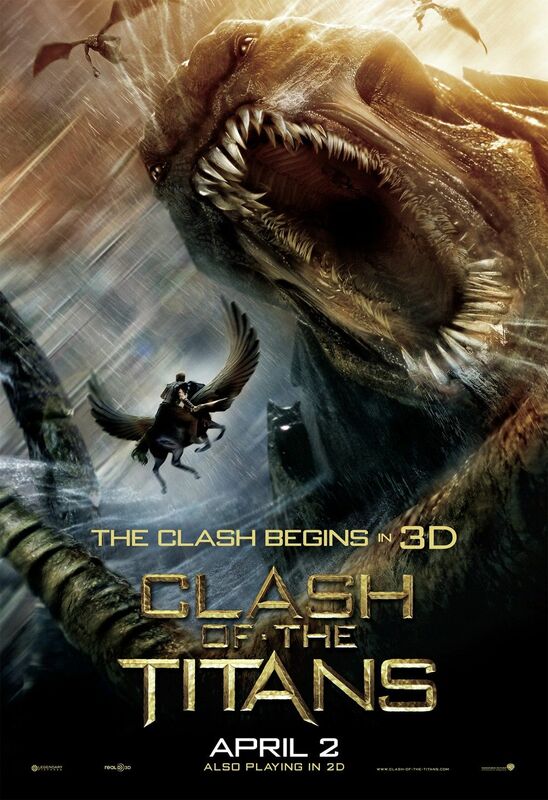 We both enjoyed the new one, but I think I must be getting old, the whole 3-D effect just didn't do it for me. Maybe the technology is not quite their yet, I think I would have enjoyed the movie better watching it the old fashioned way like I did the original back in the day. As some of you who have been reading my blog may know I'm a big fan of the Planet Algol blog. 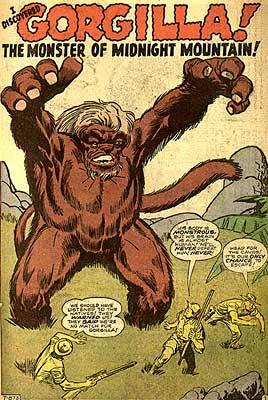 So today's Simian Saturday is sort of a shout out to that cool setting with a little beastie of my own. Hope Blair doesn't mind me putting my own little spin on his uber cool setting. So without further ado I present the War Chimps. Standing about 3' tall, War Chimps are stocky ill-tempered chimp-men who use weapons and light armor. War chimps are believed to have originated from somewhere in the Jungles of Venom. Apparently in the distant past an unnamed sorcerer brought several specimens of chimp back with him to the Iridium Plateau to serve as guardians and soldiers for his stronghold. 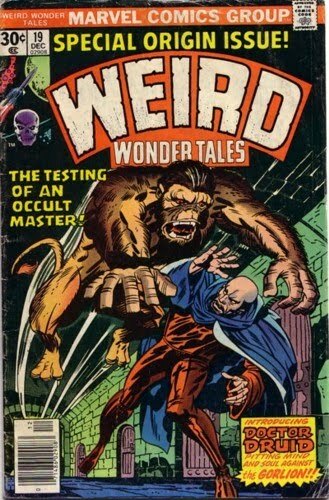 The sorcerer worked magic to enhance the intelligence and abilities of these beasts and over time the War Chimps increased in number and developed greater intelligence, learning how to effectively make and use human weapons and light armor. However, they also learned human greed and that combined with their own natural savagery led them to turn on their master. They slew him, looted his stronghold and struck out on their own. Although rare, they can be encountered in scattered areas in and around the Iridium Plateau, sometimes working as mercenaries, sometimes raiders, oftentimes both. Few reasonable folk will hire them as soldiers, due to their unpredictability and savagery; they are not opposed to dining on their fallen foes if food is scarce. I kept their stat block fairly basic so you can use them with whatever OSR mechanic you like. 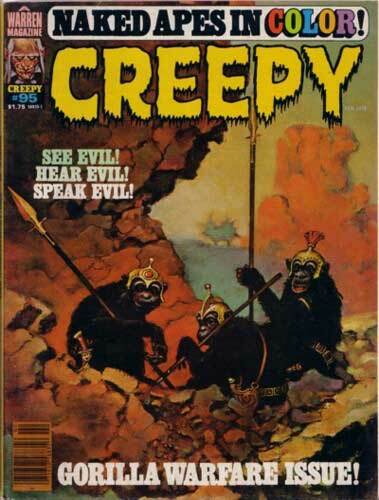 When I found this picture on this old Creepy Magazine I just knew I had to work these beasties up for Planet Algol. What's going on in the Gameroom?? Things have been quiet up in the gameroom of late... Let's go take a look and see what Old Bill has been up too shall we? I loved the above map from the original Dungeon boardgame, I spent hours and hours moving my minis around on it, I dug it and the above Greyhawk maps out of storage awhile ago and took them today to get them laminated. Figured they needed to go up on the wall. While out and about today I stopped at the local Comic Shop, I've got a confession to make, I never read the D.C. Warlord series, I know I'm terribly ashamed, but to make up for it I got the Showcase compilation (it was on sale at the shop) and a couple of other issues of the comic. Dang how did I miss this one after all of these years! Good stuff. And perfect fodder for a campaign idea I'm working on. Just a random shot of what's on my gametable these days...hmmm looks like some old school stuff, and a cool Marvel Universe guide to the Conan Universe. I've got some ideas percolating, probably gonna be posting a bit differently in the future on the blog. I'm gonna take a break from Mutant Future for awhile. Mutant Future has been fun, but my old stuff is calling to me...so who knows what may develop. In the meantime I hope everyone has a wonderful Good Friday and I wish you and your family a very special Easter, for those of you who believe, as do myself and my family, remember to take the time out to reflect on the reason for this holiday weekend.